Over the last several years I have heard much about the popular fitness craze known as Shaun T.’s “Insanity.” Many of you have undoubtedly seen the commercial advertisements. Buffed out twenty-somethings are seen jumping around and performing brutal plyometrics and calisthenics to the point of utter exhaustion. As a clinician, I was, of course, curious about this program’s potential benefits and flaws. I was also a bit jealous. So, at the tender age of forty-one, and as part of my grand experiment, I have begun to partake in the insanity that is “Insanity.” I am currently 4 weeks into the program, and I have much to say. The following points are my opinions based on many years of both being a physical therapist and a pseudo-jock. 1. The insanity program involves six (6) days of exercises followed by one (1) day of rest. There is absolutely no way that I can handle sticking to this schedule for the recommended sixty (60) days; it is simply too hard at my age to recover. I started doing the program every other day, and I am now up to performing the routine four (4) times weekly. I have no plans on increasing the routine to the recommended frequency. I recommend starting this program very gradually! 2. There is no equipment used with “Insanity,” only exercises that can be done with a bit of floor space and your television. There is a lot of jumping, running in place, and creative modifications of push-ups, jumping jacks, squats, yoga-type stretches, and core exercises. The advantage to this type of program is that you can “bring it with you” if you are not always at home. 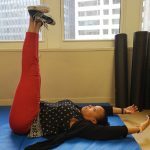 A disadvantage of this program is that certain muscle groups are very difficult to effectively condition without equipment, namely the muscles that are involved with pulling type motions. The biceps and the latissimus dorsi muscles, for example, are barely exercised with this routine. 3. Do not feel bad about modifying this program, particularly with the more intense plyometric exercises. Jumping, in particular, is an intense activity. All of my jumping exercises are done at about one-half the intensity and at one-half of the speed of “Shaun T” and his crew. Who cares? Nobody is watching. 5. It is entirely possible that you will become injured from doing this program based on the intensity and type of exercises that are performed. With high reward comes high risk. If you are feeling abnormal pain from these exercises, get yourself checked out by a medical professional. Also, realize that our physiology changes as we age. Tendons, in particular, are less vascularized with age and are susceptible to inflammation with repeated intense exercises. If you are not feeling right, take several days of rest! Although the first week of this program was a brutal experience in terms of my body recovering, I am now starting to see the positive effects. My metabolism and energy levels have skyrocketed. My mind is clearer, and I am looking leaner and stronger, particularly in my legs and abdominal region. I do now feel that I can complete the program! Does anybody have anything to add about “Insanity”? I am all ears. Great article. 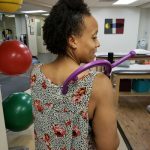 I’m 40, have exercised on and off my entire adult life and now I’m finding that the joint and muscle stiffness is more prevalent after exercise. I started P90X two weeks ago and I’m beginning to feel my lateral epicondylitis return. UGH! I don’t think my tendons and ligaments can keep up the pace of the program (6 days/week). I definitely will insert more rest days otherwise I know things will keep getting worse. Jim, I feel your pain. Be careful with the elbow epicondylitis, it can be extremely nagging if it is not allowed to heal! I would love to try this program but I have problems at times with my knees. If I wear a brace will I be able to this program? Tonya the program is a bit intense. I would get cleared from a doctor first, and it is always a good idea to modify some of the exercises so that they are manageable. I would also wear the brace as well. Im a skiny dude 28 is this program ok if i want to get muscles or is just to lost wiegh? Ral it will give you muscles, but I don’t think that it will add much size to you. 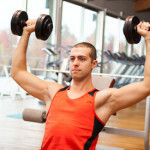 In order to add size, you probably want to do weight training with heavier weight, fewer repetitions. With the “Insanity” program you aren’t really doing that. I am on day 25 and I am absolutely loving Shawn T and his insanity program. Insanity is a dangerous high impact workout, yes the risk of injury is high, also you will not get results without good nutrition, supplements, and rest. Simply doing the workouts will not get you any results, I have a friend who has done the workouts and honestly have not seen much of a change in him, I do not think its worth the risk of serious injury, Insanity is even more high risk than P90X. Any kind of regular workout routine will get you in shape, but the key to getting in shape is good nutrition and supplements, and plenty of rest as well. I doubt Shaun T does not weight train, I do not think he got his body doing those exercises alone, I am certain he lifts weights to get that kind of physique. This is just the type of review I was looking for; I’ve been debating on “Insanity” since i first heard of it, but wasn’t sure if it was wise for a 43 year old woman with some joint issues to do such a high-impact workout. I need to step up my plyometrics game, though. I’ve been wanting to add something new to my routine, and I want to add something that doesn’t require anymore equipment. I’ve had success with and enjoyed a few other of Sean T’s workouts in the past. I can’t recall the name, but one was something cheesy, “Hip Hop Abs” maybe? Anyway, cheesy name or not, the workout was fun and had good energy. With “Insanity”, I was really wondering about making modifications to the program and if that would hinder my success or lessen the insanity. Judging by your review, I think I’ll be safe starting off easy, working into the program, and making modifications as necessary. I too am almost four weeks in to the Insanity program and think your review is spot on. I’m a 43 y.o. male. I finished P90X ‘Lean’ version before starting Insanity, and I think having that base, especially the core strengthening, made a meaningful difference. With Insanity i modify two moves to protect my knees, I take an occasional extra rest day to be nice to my body, and sometimes I throw an extra five minutes of yoga at the beginning to warm up more than the video provides. For results overall I’ve lost a couple inches from my waist since starting p90x and lost fat very nicely overall but also lost some muscle from my upper body since starting Insanity. My resting pulse is back down reliably to the low 50s and blood pressure has dropped – it’s tough-tough as a program and the cardio benefit is significant. I’m a washed-up rugby player and Insanity is as tough as any conditioning routine I used to have to do. The reason I came to read your review is I’m looking around and wondering what program should I follow next. Thoughts? My mantra has always been “mix it up”. Try something that you perhaps have not focused on in the past. Have you tried using an erg / Concept II rowing machine? Swimming? If you have steered away from weights for a while you could try the “Body Beast” that just came out (I would go for lighter weights, more reps with something like that). The sad truth that I have learned through many years of practicing physical therapy is that doing the exact same activity for exercise over long periods of time inevitably leads to some sort of tissue breakdown. Mix it up. I have this program but the author is correct, there are certain muscle group that ARE missing…. because this is mainly body weight / no equipment. I LOVE the tape but like the author, I do it at HALF the speed of the “stars” on the show. There is NO competition going on in my living room …. so I do what I want…. and if I don’t like a move… FORGET IT – don’t do it. It isn’t the end of the world. But it is a GREAT workout…. for you at YOUR pace. But you should supplement it with other movements…. I’m a 43 year old woman, have been fairly fit most of my life. I did Insanity about a year ago and whilst I agree that there is a high risk for injury, I believe recovery is directly proportional to the type of foods that you eat during an intense program such as this. I have done Kenzai programs since 2012 and i absolutely love it. It is not “crazy” but it really works! The program has spread purely by word of mouth so you will never see any advertising for it. Check it out – http://kenzai.me. Do it for 90 days and I would love to hear your feedback. Thanks Patsy, I shall give it a look! I think that I am going to give it a try Justin. Thanks for the info! I’m well over a decade older than you Dan. Today I took my first live insanity class with a certified insanity instructor. I have taken a number of different classes over the years including bootcamps. These are my comments: its not as cardio as some other fitness routines- I was never to the point of searing lungs & complete breathless. Therefore, I personally wasn’t going aenerobic. Muscle fatique came fast and early. This I think isn’t due to the exercises themselves (really there is no new exercises that I could see) but to the placement of the exercises in the routine. High power exercises were placed back to back ie. Burpees, jump squats, lateral suicides. Also there was more than ample time in pauses between sets to recover almost to the point of relaxing. Compare this with a JM Shred program where there is no down time or water sipping. There also wasn’t much floor work no crab/bear crawls and only a small amount of agility/speed work. Yes, it was only one session. I agree with you that mixing it up is a good approach. 30 to 60 days of watching video isn’t for me. Nor is sweating up the living room into a gym locker. I truly believe in the Movnat approach to fitness: practice basic functional movements everyday with every opportunity andimprovise. Have joy in movement for its own sake. Mix it up & use a little insanity when you feel you need it. I used to do insanity max and running, I was injured and developed anemia. I felt tired and burnt out every day. The doctor I went to told me that high impact exercise is actually not the best for getting in shape and improving health, and that I would be better off with low intensity gentle exercise for a longer period of time. So I switched to doing gentle aerobics/biking/light strength training/tai chi for about 1-2 hours a day. I’m feeling a lot better, actually enjoying the act of exercise instead of just the brief high afterward, and I’m finding it much easier to lose weight. I also learned that this tendency to try to burn ourselves out with exercise is mostly a western thing, in eastern cultures this is considered to be bad for the body. Based on my experience, and the fact that graveyards are filled with people who pushed their workout too hard, I would say they’re right. Yet I still struggle to feel like I’m not doing anything during my workouts, despite getting good results. It’s a hard social conditioning to unlearn. I really do think that especially as we age, your take on exercise is very wise.